If this is at all accurate I didn't think it appropriate to place it in the eBay section. Tonight I ran across this auction for a guitar that is supposedly made by Semie for his grandson Dustin. There is a long story and detail that goes with it, but in short they say Dustin's mom needed money and pawned it and now it's for sale. 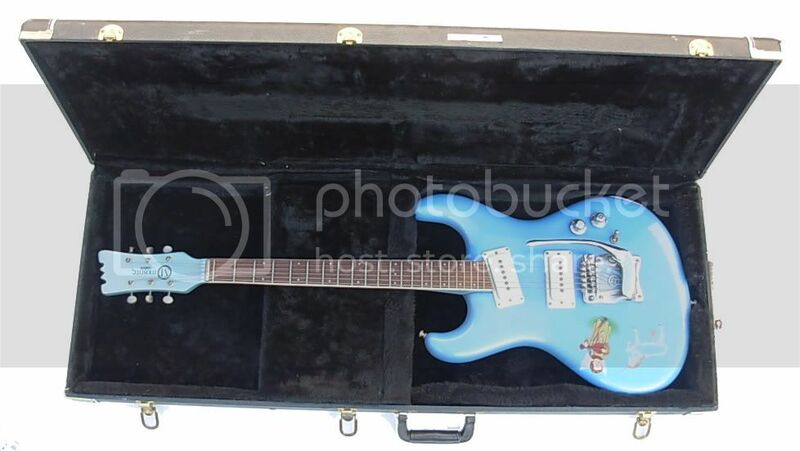 If this guitar is truly authentic it would be a shame to let something happen to it as I believe it should be preserved in some way and returned to the family if possible. Any ideas or more information on this one? Yep, it's authentic. That one has been on and off eBay for years and collecting dust on Sunset Blvd. The seller is Vintage Gear Hollywood. It kinda strikes me in a sad way to see something he made for a family member get sold like that. If there is ever a Mosrite museum it would belong there. members were up at Jonas Ridge. I just don't remember when in that year. I talked to Dana,and she said that guitar ended up in a pawn shop in Utah,and Dustin pawned it and also has a really small neck,(it wes made for an 8 year old). TO CORRECT THE INCORRECT STORY. HOW THE HISTORY OF MOSRITE IS GOING TO BE REMEMBERED.